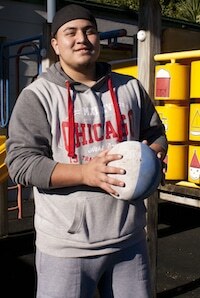 17-year-old Tawhiri was excited at becoming a dad. He left school and started working a week after his son was born, to provide for his new family. However he hadn’t counted on the demands a new-born makes on its parents’ sleep patterns and relationships. A teacher at the local teen parent unit recommended Tawhiri attend Iosis’s Young Fathers programme. Initially Tawhiri found opening up one-on-one with the Young Fathers youth worker was difficult. But after a while he found his weekly chats with Allan, the youth worker, became easier. Allan offered support and advice, not just on relationships and family matters, but also on practical issues, like getting a driver’s licence.